Tree swallow eggs at most study sites in the Great Lakes basin were minimally exposed to legacy organic contaminants and brominated flame retardants. A typical tree swallow (Tachycineta bicolor) studied by the scientists. Photograph credit: Thomas Custer, USGS. The diet of tree swallows, Tachycineta bicolor, primarily consists of aquatic insects that emerge from surface-water bodies like lakes and rivers. These insects can contain contaminants present in the sediments where they reside. Contaminants can be transferred to the next generation of tree swallows when eggs are laid. The measurement of the contaminants present in tree swallow eggs is one way to determine if dietary exposure to contaminants is of sufficient magnitude to have adverse effects on bird populations. The objective of this study was to use tree swallows to quantify current exposure to organic contaminants across all 5 Great Lakes including 59 sites within 27 Areas of Concern (AOCs) and 10 nearby non-AOC locations. The 1972 Great Lakes Water Quality Agreement designated AOCs as geographical locations where human activities have caused significant beneficial use impairment. Eggs were analyzed for polychlorinated biphenyls (PCBs), polychlorinated dibenzo-p-dioxins (dioxins), polychlorinated dibenzofurans (furans), polybrominated diphenyl ethers (PBDEs), and a suite of 26 pesticides. These contaminants were selected because they are listed by the AOCs as contaminants of concern, tend to persist in the environment in association with sediments, and are known or suspected to cause reproductive issues. 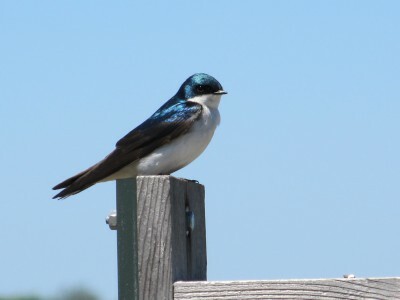 Scientists determined that tree swallow exposure was at or below background concentrations at most sites for many of the contaminants. However, high concentrations of dioxins and furans were found in eggs collected near Midland, Michigan, and from the Saginaw River and Bay AOC, downstream of Midland. Eggs from both of these sites exceeded the lower threshold value where reproductive impairment (hatching effects) could occur. In contrast, total PCBs and PBDEs were as much as 10 to 20 times less than the reproductive effects threshold at all but one AOC. Pesticide exposure did not differ between AOCs and non-AOCs or was at background levels. These findings can be used by States and the U.S. Environmental Protection Agency to assess ongoing restoration activities intended to reduce wildlife exposures to these contaminants, which can cause deformities or reproductive problems. This study was supported by The Great Lakes Restoration Initiative (GLRI) and the U.S. Geological Survey's (USGS) Contaminant Biology Program. Custer, C.M., Custer, T.W., Dummer, P.M., Goldberg, D., and Franson, J.C., 2016, Concentrations and spatial patterns of organic contaminants in tree swallow (Tachycineta bicolor) eggs at United States and binational Great Lakes areas of concern, 2010–2015: Environmental Toxicology and Chemistry, doi:10.1002/etc.3496 (Advanced Web release).